Moku:Lab’s digital Lock-In Amplifier supports dual-phase demodulation (XY/RØ) from DC to 200 MHz with up to 100 dB of dynamic reserve. It also features an integrated 2-channel oscilloscope and data logger, enabling you to observe signals at up to 500 MSa/s and log data at up to 1 MSa/s. intuitive iPad interface, or with Python and MATLAB (LabVIEW coming soon). Wirelessly configure and monitor your Lock-In's performance, all from anintuitive iPad interface, or with Python and MATLAB (LabVIEW coming soon). The Lock-In Amplifier’s signal and reference inputs can be configured for AC or DC coupling and 50 Ω or 1 MΩ input impedance. The signal input also features four input gain settings to make use of the full dynamic range of the ADC. Moku:Lab’s Lock-In Amplifier features a dual-phase demodulator with cascaded single pole low-pass filters to attenuate the second harmonic and suppress noise in each quadrature. Demodulate your input signal with an internal or external reference. In internal mode, the orthogonal reference signals are generated internally using a direct digital synthesizer (DDS). In external mode, you can select between either direct or phase-locked options. In direct external mode, the input signal is demodulated using the reference input signal for single-phase demodulation (X). The phase-locked loop option reconstructs two orthogonal references that are phase-locked to the reference input signal to support external dual-phase demodulation (XY/RØ). Monitor up to two signals at a time using the Lock-In Amplifier’s integrated 2 channel, 500 MSa/s oscilloscope, and continuously log data at up to 1 MSa/s using its in-built data logger. Moku:Lab’s Lock-In Amplifier can serve as both a sensor and feedback controller with its built-in PID Controller. The PID controller provides real-time control over proportional, integral and derivative gain profiles with configurable saturation. 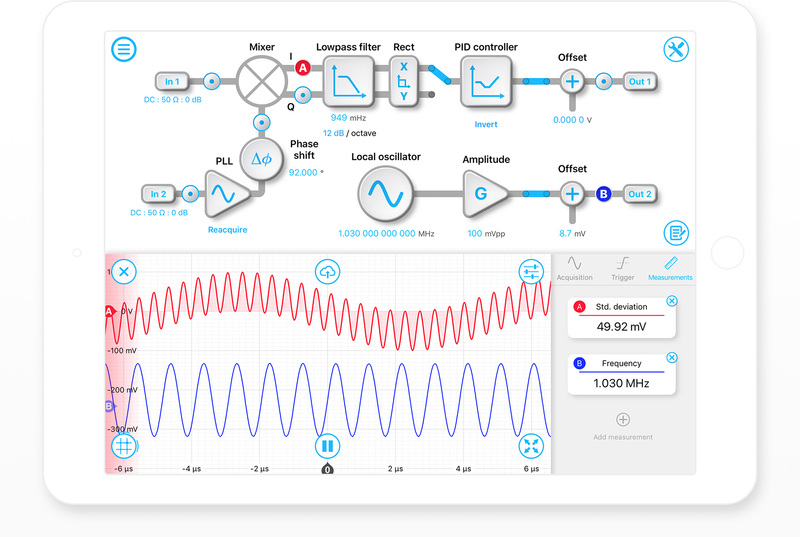 Stay on top of how your instrument is configured with a high-level view of the lock-in amplifier’s signal processing chain and intuitive block-diagram interface. Export your data to Dropbox, SD Card, iCloud or e-mail. Moku:Lab can save an image of your screen or export your data in CSV or .MAT formats. Integrate Moku:Lab’s Laser Lock Box and its other instruments into your existing system using LabVIEW, Python, and MATLAB APIs. Can I adjust the corner frequency of the low-pass filter? Yes! It is adjustable from 237 mHz to 3.98 MHz via an iPad, Python or Matlab. What is the maximum rate at which I can save data, and how many points can I save? The sample rate is dynamically adjusted by the horizontal zoom of the display, and can be set up to the full ADC sample rate of 500 MS/s. Currently you can save 16k points for two channels simultaneously. For longer term data taking use the new data logging mode. Logging to CSV is supported at up to 1 kS/s. For faster data rates use the .li binary format which allows logging to SD card at up to 100 kS/s and logging to the Moku:Lab's RAM at up to 1 MS/s. Can the Lock-in Amplifier demodulate using an external source? Yes!! The September 2017 software update added support for direct demodulation with an external source, demodulation with a PLL (Phase-locked loop) locked to an external source, and the ability to modulate and demodulate at different frequencies. Does the Lock-in include a PID controller for feedback applications? Yes! A PID controller was added in the September 2017 update. Update your iPad App to get all the new goodies. The Lock-in can readout I and Q (X and Y). What about R and theta? Following the September 2017 free update, to switch from an X and Y readout to R and theta on the Moku:Lab App, tap the X Y block on the block diagram. The default theta gain is 0.8 V/cycle.